Special "Kirtan Sunday Feast" with Gaura-Shakti - Jan 5th ~ The Toronto Hare Krishna Temple! 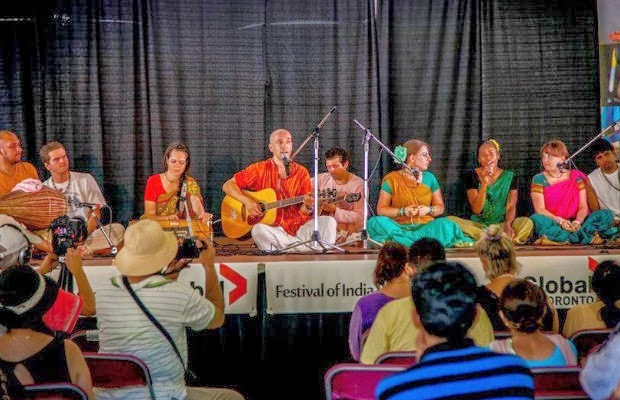 The Toronto Hare Krishna Temple's very own kirtan yoga group, Gaura-Shakti will be putting together a very special presentation for the Sunday Feast on January 5th, 2014 from 6:00pm to 9:00pm! As the new year begins, Gaura-Shakti would like to make a special offering to our beloved Deities, Srila Prabhupada and all the assembled devotees of our community in a form of bhajans and kirtan! Since 2009, Gaura-Shakti has been presenting kirtan throughout Toronto and the GTA. Sharing the sweet sounds of kirtan at yoga studios, expos, conventions and more, thousands of people have been introduced to the sweet sounds of kirtan! On Sunday, January 5th, Gaura-Shakti will present a magical night full of the sublimely sweet sounds of bhajans and kirtan accompanied by different beautiful instruments! We hope to see you there!